Packing School Lunches Your Kids Will Love! If you’re like me, you have kids who have brought home their lunches either full or half eaten. It’s the age-long dilemma of packing a lunch that is not only nutritious but also one that they’ll actually eat. I know when my girls were younger I often worried if they were eating enough or if they would like what Darasak and I had packed. Often times, it would feel like I sent off food for a day trip because it came back uneaten at the end of the day. Other times, it came back completely eaten. With years of making school lunches under my belt, I’ve discovered a few tips and tricks on what works and what doesn’t. 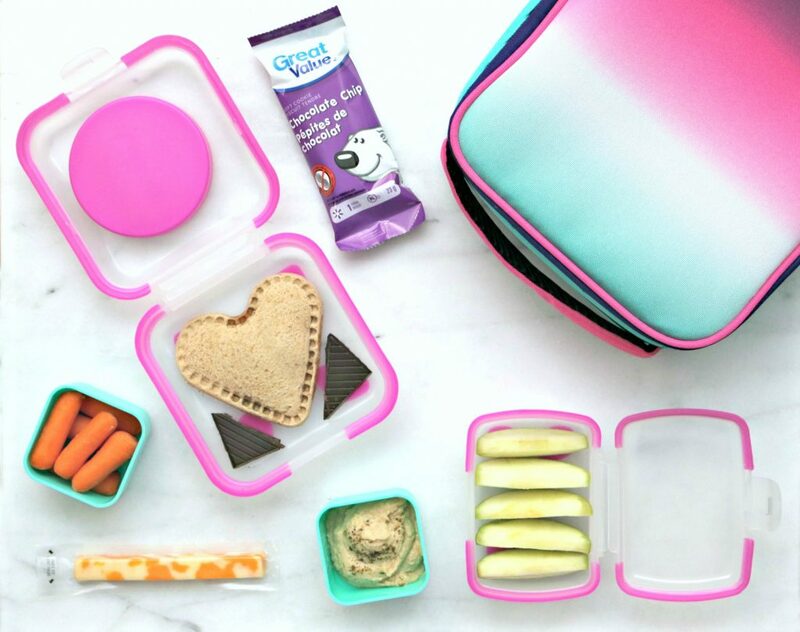 Read on to discover 7 tips for packing school lunches your kids will love! 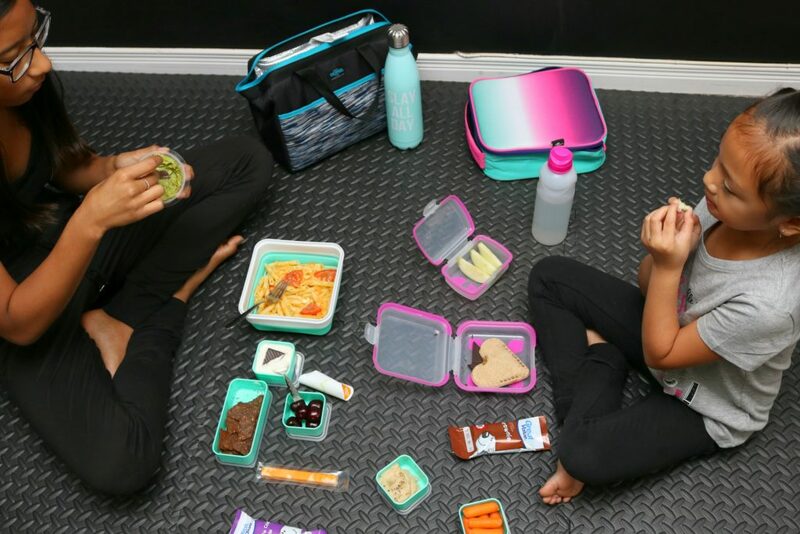 Kids get excited about new lunch boxes, water bottles and yummy snacks. I know that my kids look forward to back to school shopping every year just for this reason. Walmart has an impressive assortment of lunch bags and containers that are colourful, trendy and functional. Believe me, there is something for every child. Whether it’s the fashionista or the emoji lover–there’s plenty to choose from. The girls picked out new and fun lunch boxes and loved what they chose. Gabby picked up a lunch tote and Mimi grabbed a lunch bag that came with everything she needed. It came with containers and a water bottle for a low price. We also picked out some fun bentos that are expandable and carry a lot of food. Bonus to the bentos, the middle tray is an ice pack! I always make it a point to buy new containers every year because I like being able to use them over and over again, eliminating the need to use plastic bags. They are also great for sending leftovers. Gabby loved her new water bottle, the colour is awesome and has a fun saying that is in all the kids’ vocabulary these days! As much as I’d like to think that’s what I do every day, I know that I am rocking it in the lunch-packing game right now. Walmart is one of my favourite places to shop for kids’ snacks, fresh fruits and groceries. The kids love the Great Value snacks and I love that I can pick up my fruits and veggies here too. They also have individual size guacamole, which is super convenient. Plus, I even pick up my meat and other items like pasta, bread, cheese and yogurt. The quality never disappoints and the price is always on point. It’s affordable and since you can virtually pick everything up in one trip, it’s a one-stop shop for back-to-school and beyond. While parents should ultimately have the last say, I like to let the girls write down snack or meal ideas they want during the week. Letting your kids be active in the planning may result in them eating their lunch since they know exactly what they’re having. When they are younger, you can give them options with a little game of this or that. Try to rotate the ideas as much as you can and aim for about 4 different items so they have variety! What better way to empower your kids than to let them help make the meals that they planned? Older kids can take care of making their own sandwiches and packing their snacks. Younger kids can help you wash fruits and veggies. Another way I get the girls in the kitchen is to have them make muffins together. Gabby often makes cold pasta dishes and other quick and easy meals. Having them help in the kitchen gives them a sense of pride and I’m happy they are working on life skills they will use forever. Plus, they know exactly what is going into their food since they made it! No icky surprises! Since school is right around the corner, we are preparing for the school year and going over lunch ideas. We decided to make a list and ended up with handmade PB & J stuffed sandwiches (made with soy), carrots, cheese, crackers, apples, juice and a treat. Don’t forget to pack water too! But, I found that if I shaped their food into different shapes, they were all of a sudden more fun to eat! Who would have thunk? The easiest thing to do is grab cookie cutters and use them to shape their sandwiches, fruits, and even cheese! Believe me, it works. One of the biggest concerns that my eldest voiced over the years is that lunches can get boring. After all, sandwiches can be a bit of a snooze if you have them every day. We try to change it up at least 1 or 2 days during the week. We will make cold pasta dishes, chips and dip, pizza and even rice and chicken. The possibilities are endless and luckily, you can pick everything up at Walmart. Often times, you can make their favourite dish for supper and pack a little for the next day. I make it a point to pack a little treat once in a while. Whether it’s a small handful of jelly beans, a chocolate coin or a square of dark chocolate. A little something to brighten their day. This isn’t necessary of course but, I know that they are getting a balanced meal; having a little treat is a bonus. I send dips with their lunches as often as I can. Especially hummus, white bean hummus or guacamole. It’s a great way to get extra protein and healthy fats into them and let’s face it, kids love to dip. You can pair them with carrots, cucumbers, sugar snap peas, grape or cherry tomatoes, pretzels, pita chips, tortillas, and more. You can also pack yogurt, add a bit of granola and they can dip it with fruits. It’s always a hit and it’s a great dose of protein. Knock It Out of the Park This Year! Now that you have some tips for packing school lunches your kids will love, you’re ready to go! Make sure you visit your nearest Walmart to pick up all the back to school essentials. You’re armed with the tips, now you need the gear and snacks. There’s a wide variety of lunch bags, water bottles, containers and more. Soon enough, you’ll be hitting home runs. For more information and to see the variety, visit Walmart.ca to check out everything back to school. 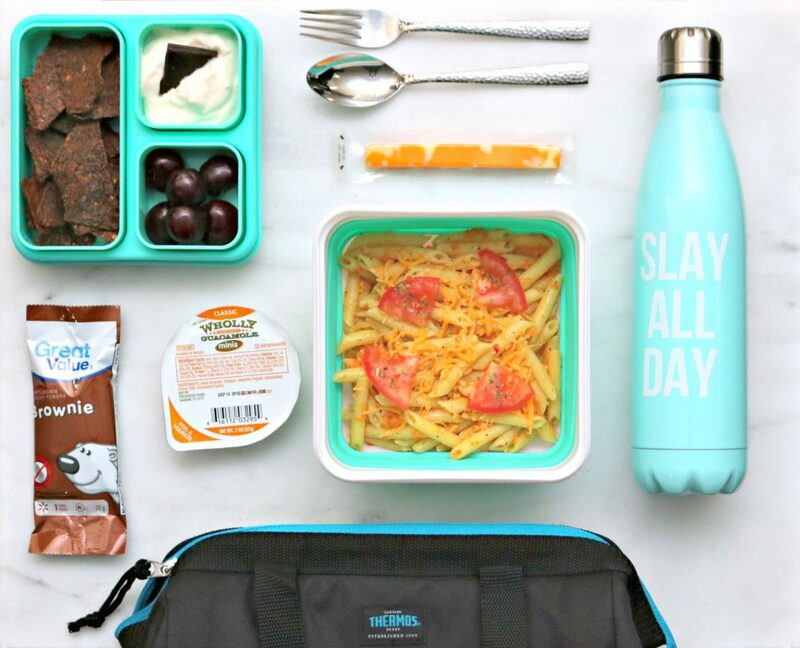 What do you pack for school lunches? This post is sponsored by Walmart Canada as part of the Back to School Lunch and Snack Solutions program. In exchange for this review, I have received special perks in the form of products and/or compensation. All opinions on this blog are my own. Previous Post: « Getting Creative with Kidizoom Smartwatch DX2 & Action Cam 180 + Giveaway! I like the idea of letting kids help plan their lunches. When they help pick out snacks and lunch items, they tend to eat it with no complaints. Great tips! Exactly! They’ll have no excuse not to eat it! My little one can LOVE something one day and hate it the next. It’s so weird. I change his lunches up A LOT. Variety keeps kids looking forward to their lunches. When it’s boring they don’t want to eat it. This is exactly what we are struggling with right now. My son is bored with sandwiches so I told him to pick out a whole bunch of different stuff and that way he can have a variety. I love everything you mentioned here. So you like it too! My kids were just the same but now that their older they have opened up their palette. My kids are all about textures when it comes to packing their lunches. They insist on something crispy and crunchy & something smooth. My youngest two are notorious for putting apple chips on their sandwiches for extra crunch. That’s too cute! My kids do that sometime. Adding weird combinations to their sandwiches! These are fun ideas! I love the matching containers and water bottle. We don’t pack lunches anymore since we homeschool now, but I still like to have containers like this for beach days. My daughter is obsessed with dips! I think she would eat anything if it’s accompanied by a dip, lol. That’s so funny my youngest daughter is just the same! Any sort of dip for veggies is usually a hit with my girl! Hummus, yogurt/tzatziki, or ranch dressing! My girls love that too! Especially hummus! If we will eat it the kids will eat it. So we always pack some great food that we know they will enjoy. My kids are the same! These look like some delicious ideas! I normally am boring and just do sandwiches or Lunchables for my kids. I tell them they can pack what they want, and they usually go for chips. Or just stick a banana in the box and call it a day. Get them involved in better choices and making it fun too! Thanks this is a great post,it’s totally true a fun lunch will get eaten more often than a plain lunch,helpful tips thanks for sharing ! You’re welcome! Lunches should be fun and looked forward too! Not plain and boring. I agree one of the best ways to get them to eat new foods and eat it all is to let them help make it. My kids love being in the kitchen and they try newer foods if they can help. My kids are the same! They like trying new foods! My son is 16, so a little beyond these lunches. I wish I had these ideas back then! Love fun lunches like this! Why not make it fun right! I love all these little lunch foods. I’d love to enjoy most of them myself! I’m the same! I try not to snack on them while I’m making them! am i a bad mom for making my kids make their own lunches?? this makes me want to make their lunch tomorrow!!! i love it! great job! I generally don’t pack school lunch as my son gets lunch in school. I did have to pack it all summer this year. It’s simple, I just make sure I cook enough at dinner so there’s leftovers and there’s lunch for the next day. I love your lunches! They look so pretty and fun to eat. It’s always been a struggle to get my son to stick with anything for lunch, so now he’s getting it at school. He’s also in high school now, so he has opinions about everything! Thanks! I’m sure we’ve all had that struggle at some point! Ohh, who would not love to have their packed lunch in this food storage box. School essentials need not be very expensive too, you just need to be creative. It’s all about being creative! Makes it fun and enjoyable! I have two lunches to pack every day now. These are great tips for a smoother, easier morning. I love these tips for making lunch prep easier. My kids are grown, so I am past that stage of packing school lunches. I love your ideas though, especially the one about getting the kids involved in planning. I know they like that and it builds their confidence at the same time. I will be sharing this post with my cousin who has young daughters in elementary. Thanks! Please share to friends and family! I like to use small containers for fun snacks. We try to have a little surprise each day. Thanks for these tips. I think these lunch ideas would guarantee that our kids would have the proper nutrition while at school. 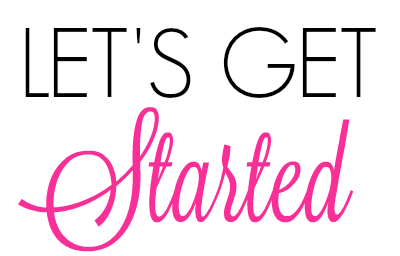 My kids are grown, so I guess I will send your link over to family and friends who still have young kids in school. Glad you like the tips! Please pass it on to friends and family! I love the colour-coordinated lunch sets. So pretty. Thanks for the great tips as well! You’re very welcome! I’m glad you like the tips! These are awesome packing tips, I also love the lunch kit you are using. Glad you like the tips! The lunch kit is awesome! Good idea on the hummus. I’ll pack that in next. I get everything from Walmart as well. My kids love hummus! Walmart has a great variety of products! Now that we are in the midst of school lunches, I need to keep coming up with new ideas. Gotta keep the kids looking forward to eating their lunches!